Yes, Sony made the list. Another case study for Harvard Business School. Yet, even though Lieberfarb was only asking that the same deal be extended to DVD, Blockbuster, perhaps not realizing the speed with which the digital revolution would spread, turned him down. Nevertheless, Lieberfarb, determined to make the DVD a success, went to Plan B: pricing the DVD low enough so that it could be sold to the public in direct competition with video rentals. Now, DVDs are priced so cheaply that rentals makes much less sense. Plus, Blockbuster has nothing else profitable to fall back on now that major retailers use DVDs as a price leader to attract customers. It's an interesting article that also explains how Blockbuster used its rapid growth to its advantage ... but now all their stores are a boat anchor. Maybe they were put on double secret probation. Not the movie you're thinking of. A safari venturing into unexplored territory stumbles upon natives who sacrifice a woman to a large gorilla in order to spare the rest of their tribe. It sounds like a scene from Merian C. Cooper and Ernest B. Schoedsack's legendary "King Kong," but it's actually part of the climactic sequence from the film "Ingagi," released three years earlier. 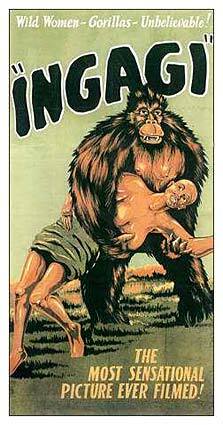 "Ingagi" is largely forgotten, but "Kong" might never have gotten made if not for the success of its scandalous predecessor.